It’s been one year since I first hit the “publish” button on my blog. I want to mark this one year by sharing the story behind the name of my blog. 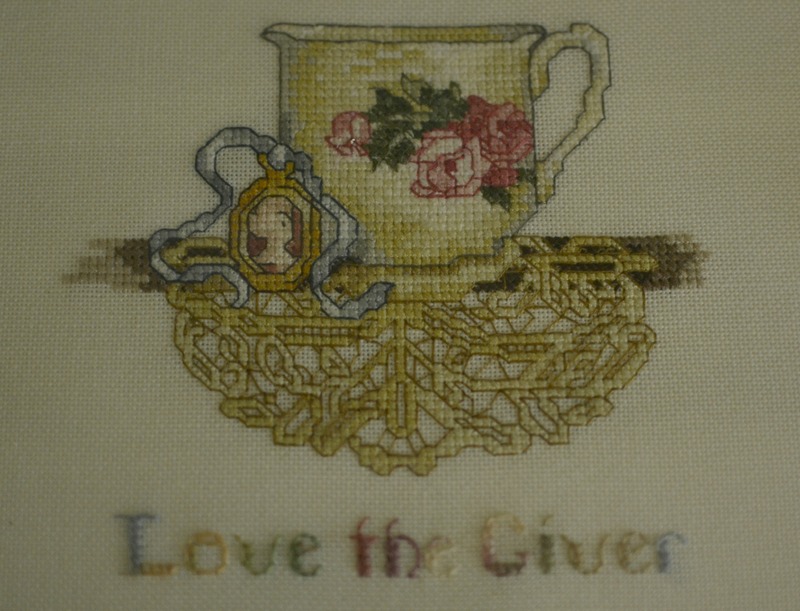 “Love the Giver” is a phrase from the Victorian period and so endearing. When thinking of a name for my blog and etsy shop, I had a page in my tiny notebook in my purse filled with possible ideas. When I would think of one or brainstorm on road trips, I would write them down, but when I thought of Love the Giver I was tickled pink! I knew immediately it was the right name. It conjures up several thoughts and all are what I had envisioned for my blog. 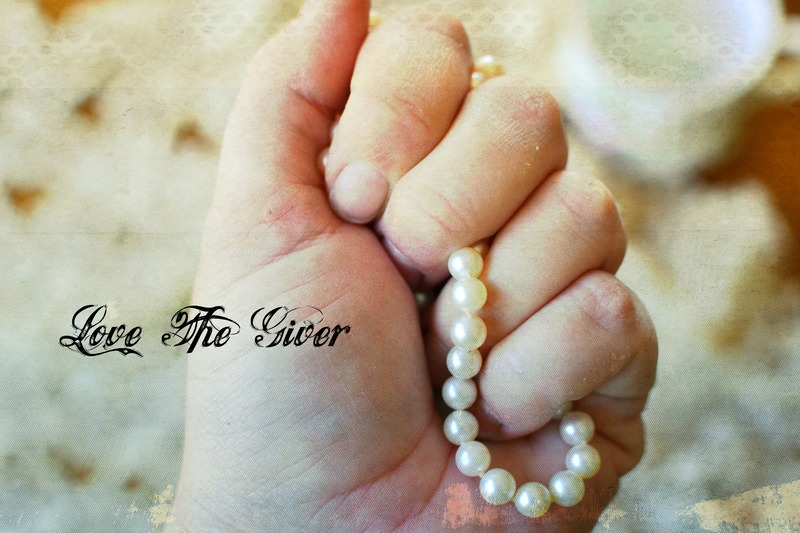 Love the Giver has been a special phrase in our family for a long while. 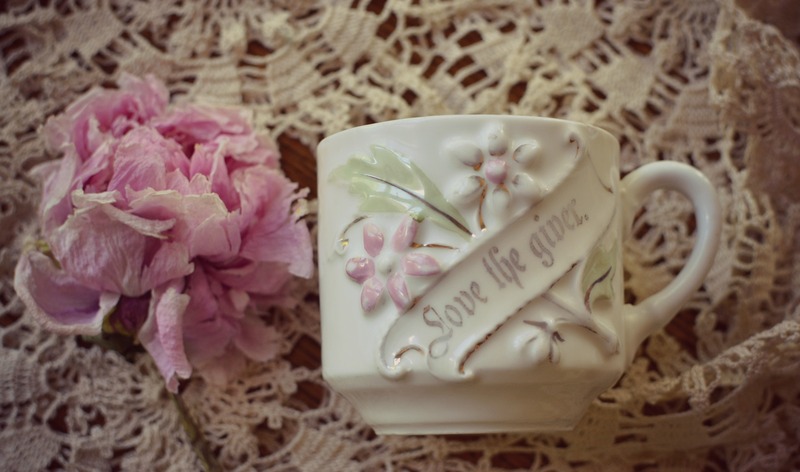 Many, many years ago Victoria magazine had an article entitled Love the Giver. This article touched my mom so much that it changed her gift giving and then our family’s giving there after. Remarkably mom recently came across it while cleaning out a drawer and I was able to read it again and be reminded of just how inspiring it is. So the writer proceeds to gather her treasured things that she owned and give them to special people in her life for Christmas gifts. For her daughter she gave earrings that were gifts from her mother-in-law their first Christmas, for she should be wearing them while she is young. For her son, a St. Christopher medal she was given in high school from a friend who had long ago traveled to distance lands to learn about life. And for her niece, her Nancy Drew books so that she could read and lose herself in adventures and for her best friend a set of silver teaspoons that were antique and well used that her friend had admired years before. And even though they were worn she knew her friend would appreciate their beauty. On each package she wrote a simple tag that said Love the Giver. It is a beautiful thought. 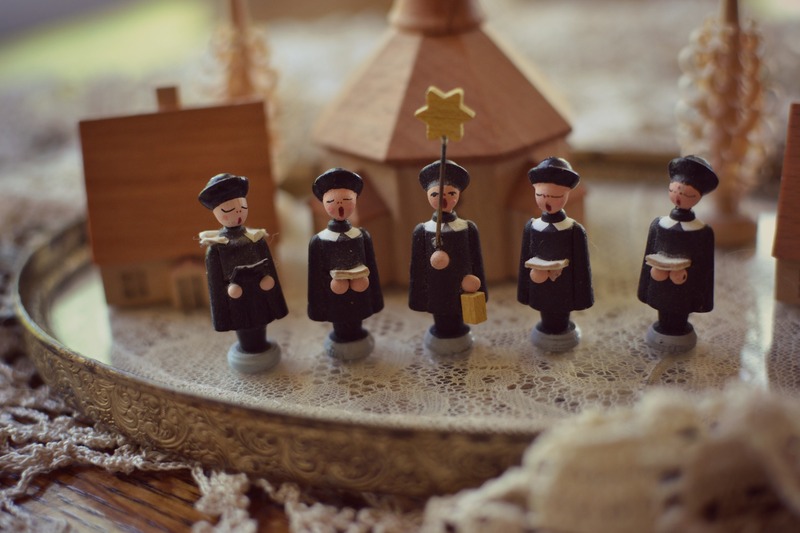 That year for Christmas I received a treasured little wooden German choir and village set that my mother bought many years ago on a trip to Germany that I had always loved and admired. In fact, I had told her it was one of my favorite things. I found it hard to accept because I knew how much she loved it too. I also received a ring that she always wore that had an emerald and two diamonds. The stone was a gift from a missionary and the two diamonds from my great grandmothers ring. Each of us in the family received something special that year. 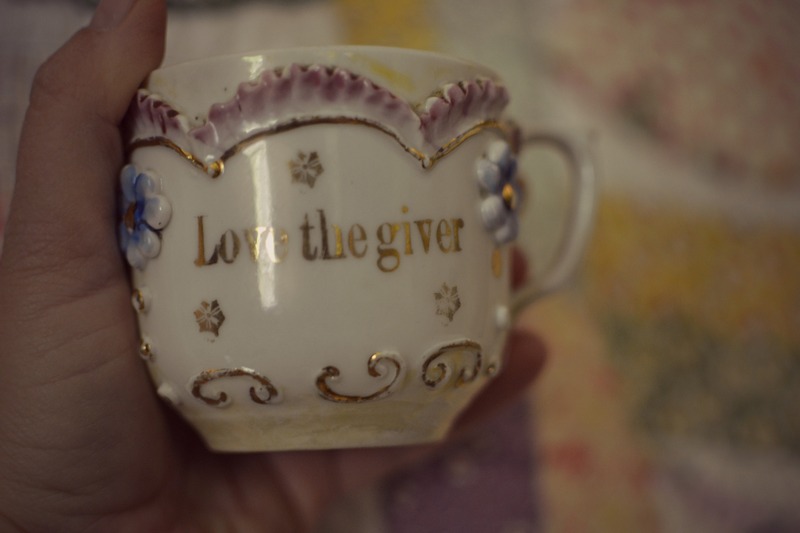 The tags said Love the Giver. 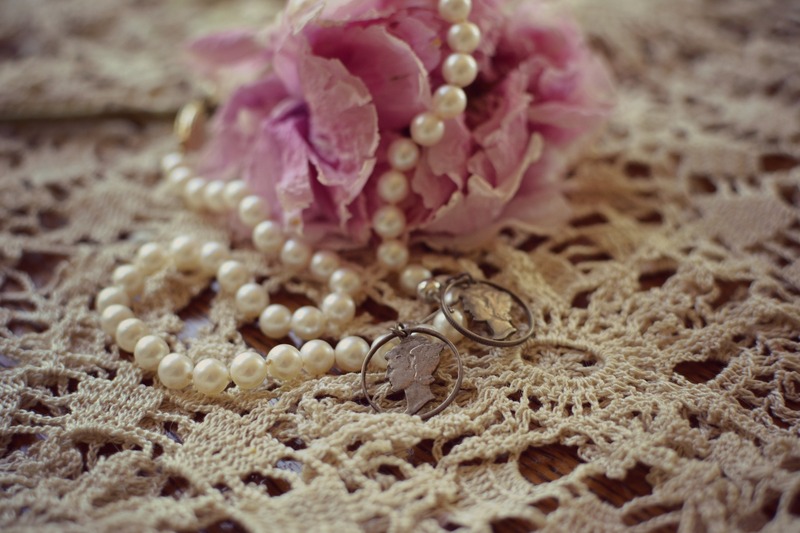 And since then the giving continues, I’ve received my mother’s pearls that were her mothers that we both wore on our wedding day, and from my father, earrings that were my great grandmothers and recently her thimbles as well. My dad has given the boys silver dollars that were his fathers. Sharing things we can enjoy now. As I gathered these things today I feel neglectful. When was the last time I wore these pearls? I’m saddened that I haven’t felt their presence on my neck. They are priceless to me but yet they have been in a box in my closet, crowded out. The same for the earrings, I’ve not ever worn them for fear of losing one. I need to wear these in honor for those to whom they belong to and in love to who gave them to me. I will. I will again wear them in joy, just as they were given to me. I have come again full circle in my reflections. I hope you will love the givers in your life, love what you have been given and perhaps think about how you can be a better receiver. I realize today I have not been. 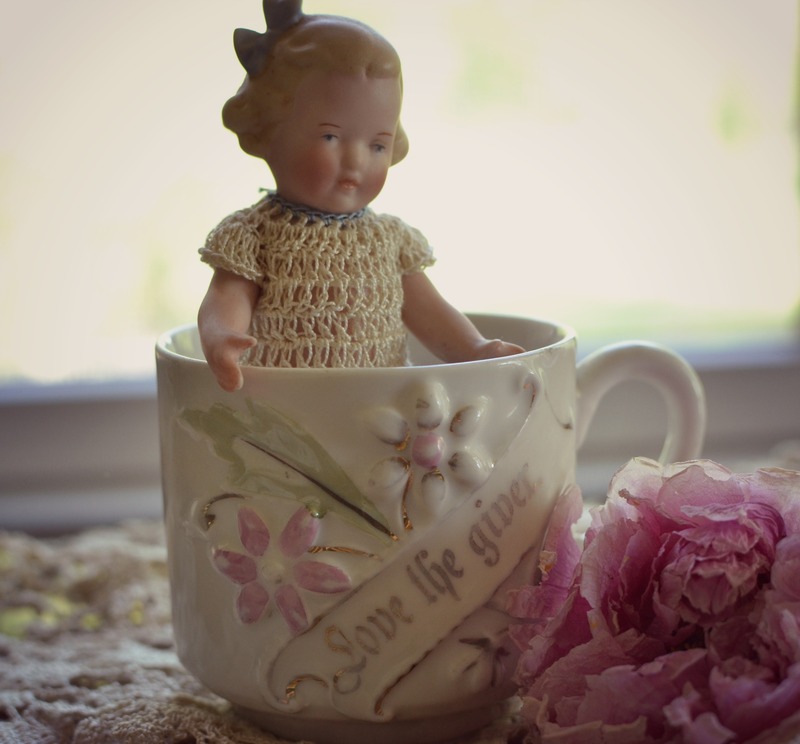 This entry was posted in jewelry, photography, vintage and tagged family, love the giver, pearls, teacup, victoria, vintage by Katey. Bookmark the permalink. What a wonderful story. I enjoyed reading about “Love the Giver”. Thanks for sharing. Thank you Brenda. Thank you for reading. I thought about your uncle and the thimble. We love you too. Dear Nina. What a wonderful story to start a new month. It’s hard to believe a year has gone by since you began sharing your thoughts and beautiful pictures here. Katey, what a beautiful story! So many of your blogs and thoughts resonate with me and this is one that I will remember. I have given some things that were special to me, but this gives it a name and substance. My younger daughter who is single is adopting two little girls (any day now) who have had sad little lives and yet they have that spark of hope and resilience that only children possess. Laurie is having a celebration when the adoption is final with family and friends welcoming the little ones. I spent hours trying to decide on appropriate gifts and then ordered pretty bracelets for the girls with “Granddaughter” on them. Then, I started to think I should do something special for Laurie, a new mom of five and ten year olds. We who have older children can only imagine the challenges which will come her way. It came to me as if it were always meant to me. Laurie has long admired a diamond filigree ring which was my grandmother’s. Of course, it is only perfect that it should be hers now with the wish for wisdom and guidance and lots of patience that has been passed down in my family. I shall cry. I am so proud of her and so happy to have two precious new granddaughters. The last time I visited Laurie and the girls, the younger one came to me pulling a little friend along by the hand. Proudly, she announced, “This is my grandmother. She lives on a mountain!” Remembering that has given me so many smiles! Life is good. So, Katey, not only do we love your blogs, but I wish to thank you for causing us to stop and think about the really important things in our lives. Enjoy the flowers; enjoy the birds; enjoy the gifts that have come to us from our families, not only the material things but the gifts of love in so many forms; enjoy the beauty of the little things that we sometimes forget to notice. WOW Katey….this is just beautiful and what an honor it is for us to cherish these gifts given to us. Thank you for opening my eyes, my mind and my heart. Katey, so grateful to you for sharing this precious story! I’ve printed the blog post so I can send it to my 83-year-old mother, who doesn’t go online anymore. It is so important to keep those family threads strong, generation to generation. Thank you for sharing this. It reminds me that it is not “what” is important but “who”. I love this Katey.your blog always brightens a day as do you. Happy Spring. Katey, I recall this Victoria Magazine article! I believe it was written by the lovely, departed Emyl Jenkins. I had the pleasure of meeting her and let me tell you, “giver” and “love” describe her perfectly. Thank you to you and your mom for reminding me to go through my “treasures” and share them. Barbara. Love your story -since I have known you, you have been the one who thinks out the most perfect gifts for every occasion and your heart shines right through in them. My Russian necklace comes immediately to mind and I am going to go eat my jam- right now! Love the story behind your blog name. Have been busy but not enough to stop by and get to know you and your tastes a little better. From what I have read and seen so far, we are indeed kindred spirits.